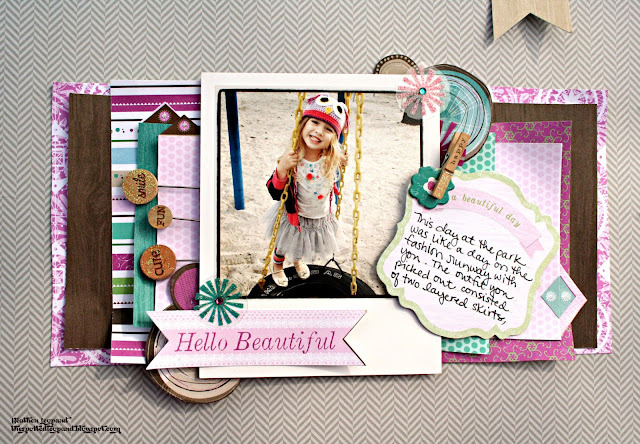 I made a page last week using the Fern & Forest Girl collection Little Yellow Bicycle sent me. At first, even though I liked the collection, something about the purply color that I saw online was throwing me off (I don't scrap purple) but after seeing it in person, it's the perfect shade of pink and purple and I just love it. I seriously can't stop playing with this collection. I think I said that about the Just Because collection too. I thought it'd be fun to create a 2nd page to last week's layout. I love to layer and this layout is no exception. 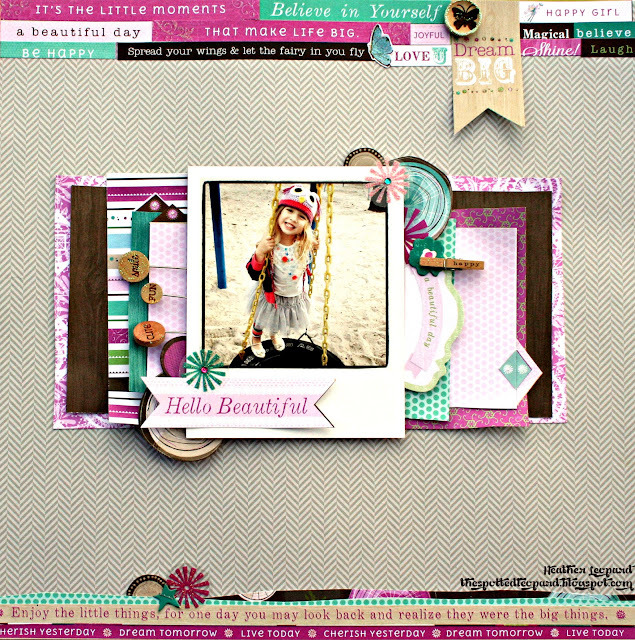 One of the big trends in scrapbooking right now is to add strips to the top and bottom (or the sides) of layouts. It usually consists of unevenly cut paper strips with labels or embellishments anchoring the page together but today, I decided to put a twist on that trend. I used the Fresh Verse cardstock stickers and added banner sticker and wooden button. 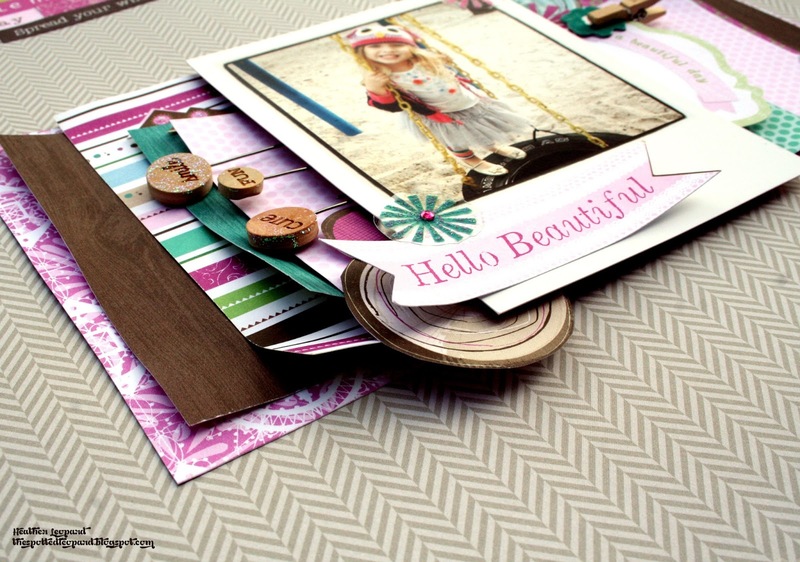 I carried the wooden elements throughout the layout, adding the stick pins to the layering and the "Happy" clothespin to the pull out journaling card. The mix of the various word elements (wood embellishments and stickers) just tells such a great little story and ties everything together. The clear cut embellishments that I used on my layout have a nice iridescent glitter look and feel but without the mess of glitter, by the way. I added a little Stickles iridescent glitter to the wood elements as well. You can see it on the stick pins above and the clothespin holding my journaling above. Oh and see that photo, I had them printed from Origrami. The prints are incredible and they come with all the details printed on the back, like when the photo was taken, how many likes it got, where it was taken. And it comes in the coolest Instagram box. Find out how you can win free prints from Origrami on the Paper Issues blog. You have until April 20 to submit for your chance to win. Heather, this is awesome! I love your little touches! oh my GORGEOUS! LOVE this layout Heather!! Love the layering and gorgeousness! Awesome use of the LYB, Heather...and I love the little cork board pins! Love the layering and the papers. Awesome use of the word strips - I love it. Fun textures. awesome~loving the pink and layering at the top. sweet!! Very pretty layout. I saw it over at Paper Issues. Pretty page. Like all the layers. Well done work,just keep it up.